The MC601 is full of many other noted McIntosh technologies. Power Guardwill prevent harsh sounding clipping that could damage yourspeakers. Proprietary speaker binding posts ensure the best connection to all types of speaker wire terminations for worry free operation. Our fuse-less short-circuit protection circuit Sentry Monitor™disengages the output stage before current exceeds safe operating levels and then resets automatically when operating conditions return to normal. Inputs for both balanced and unbalancedcablesare available to provide flexibility in connecting to the rest of your system. 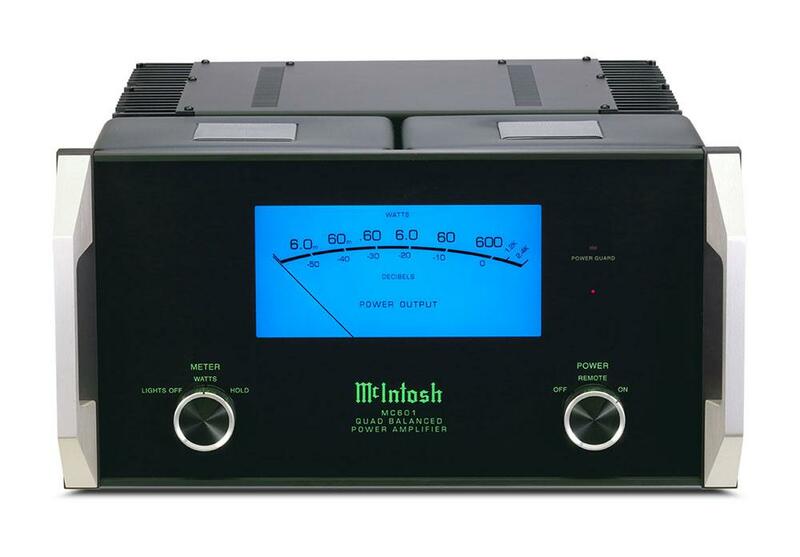 The alluring blue meter is not only a great conversation starter but also provides a fast and accurate reading of the amplifier’s power output. Visually, the MC601 is beautiful to look at with a polished stainless steel chassis, a classic glass front panel, knobs and brushed aluminum handles that all seamlessly blend with any room decor. The MC601 is an ideal choice for stereo music systems using one per speaker or multiple per speaker in bi-amp or tri-amp configurations. It is also well suited for use in home theater systems, using one to drive each home theater speaker. Contact your local dealerto learn more.